I took a picture of this mother elephant and her baby when we were in South Africa. 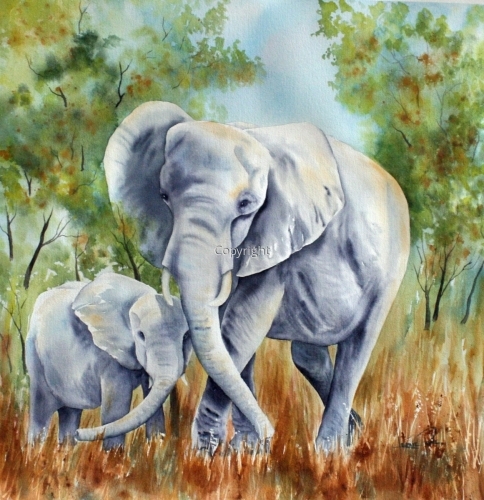 This picture of motherly love was something I wanted to portray in this painting. 9.25" x 9"10" x 10"11.25" x 11"12" x 12"13.5" x 13"14.5" x 14"
These zebras were heading somewhere but it looked like they were not sure where. We saw many when we were in Africa. I intend to paint more paintings of zebras but painting all those stripes is a bit tedious! 5" x 13"6" x 15.5"7" x 18"8" x 20.5"8.25" x 21.5"
These colourful grosbeaks come to our bird feeder every winter. I think they were courting when I took photos of them. 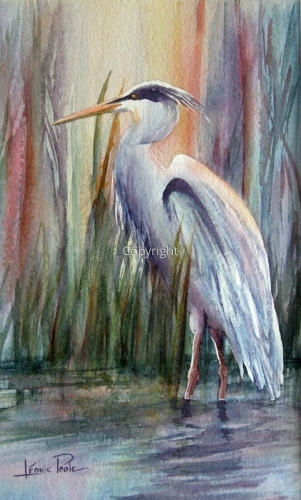 7" x 5"8.25" x 6"9.75" x 7"11" x 8"12.5" x 9"15.25" x 11"
This blue heron was wading in the water behind our place in Florida when I took his picture. The background is imaginary as I wanted to paint something colourful that day. 8.25" x 5"10" x 6"11.75" x 7"13.25" x 8"15" x 9"20.25" x 12"
Hummingbirds are neat to observe. It's incredible how their little wings can keep them hovering around flowers in search of nectar. We see lots of them around the garden in the summer. 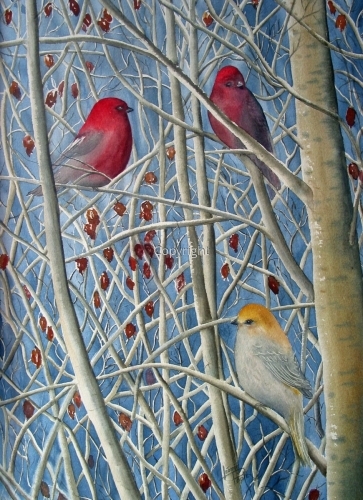 They are quite elusive and hard to photograph but I aim to paint a few more paintings of these beautiful little birds. 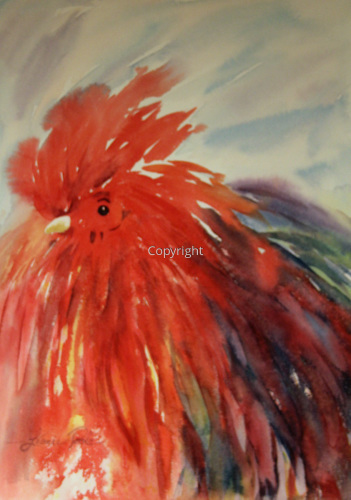 9" x 12"13" x 17.25"17" x 22.75"18" x 24"21" x 28"23.5" x 31.5"
This rooster was another try at splashy painting! 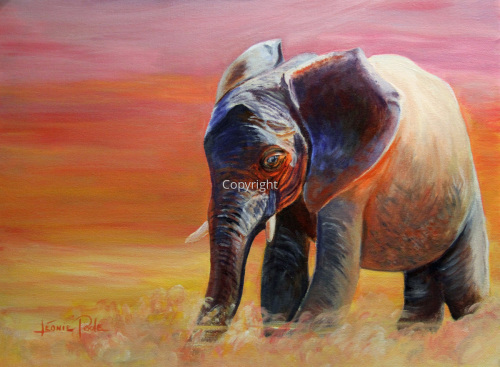 7" x 5"11.5" x 8"15.75" x 11"20" x 14"24.25" x 17"28" x 19.5"
This little elephant was not this colour when I took his picture in Africa. He was covered in mud but I wanted to show his colourful side. 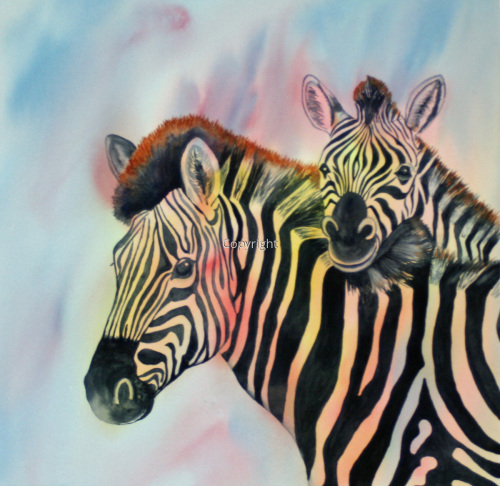 This colourful painting of Zebras was a try at using washes of colour and then painting over the wash. I was very happy with the end result and it sold right away. 7" x 7.25"8" x 8.25"9" x 9.25"10" x 10"12" x 12"12.5" x 12.75"
This painting of a section of the shoreline of Moose Lake is a depiction of the cycle of life and how all is connected in nature. 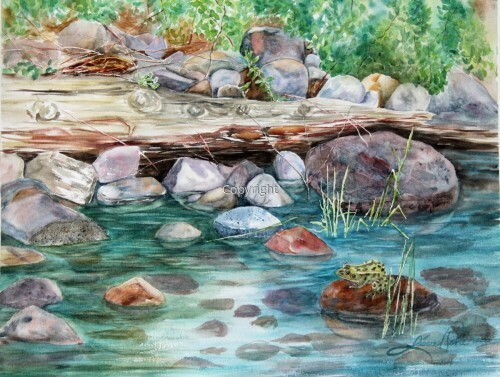 It reminds us that if we don't look after our environment, everything becomes endangered like the little leopard frog on the rock. 8" x 10.5"11" x 14"11" x 14.5"14" x 18.5"17" x 22.5"21.25" x 28"
Being that it's Canada's 150th year since confederation and that the beaver is our national animal, I thought it would be appropriate to paint a painting of a beaver. 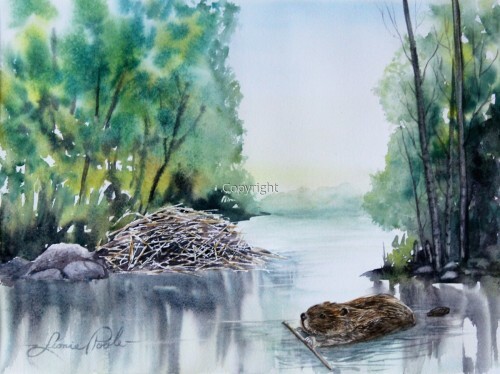 I saw this beaver helping build his dam on our lake. Not that I appreciate that they cut down trees from our shoreline, but it is fascinating to watch them hard at work. 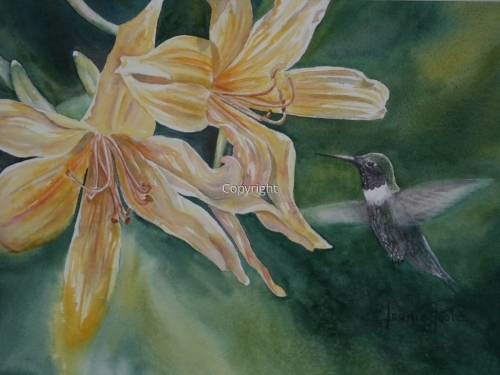 5" x 6.75"7" x 9.25"9" x 12"11" x 14.75"13" x 17.5"17.25" x 23"
Here is my latest painting. I decided to try a go at painting nests as they seem to be quite popular. Also, I'm changing my style to a splashier look. Hope you like it.